Schendt Engineering Corp. Staff has a 18 year history working at this site. During this time period, we have renovated nearly all of the 500,000SF of space within this facility. 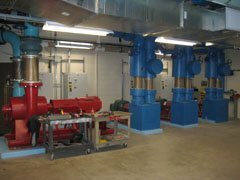 During this tenure, we had as-built all of the existing hydronic systems with in the building. The initial stage of the project involved a hydraulic analysis of the chilled water plant, and distribution systems. First we compiled a set of as-built drawings of the entire system from previous projects, developed schedules of existing equipment connected to this system, and estimated the peak connected load on the system. From this information we developed a hydraulic model of the chilled water system. Several scenarios were analyzed and compared to historical data. It was determined that the chilled water plant did not have adequate firm plant capacity to handle the current or future peak cooling load (i.e. one chiller down). The facility is over 30 years old and currently houses four (4) Data Centers with increased cooling loads over the years. With the critical nature of the Data Centers, the plant could not be shut down even for a few minutes. A temporary 500 ton air cooled chiller was installed as a back-up during construction so that we could replace the chillers and pumps on a one-by-one basis and keep the data centers on line. The facility had three (3) 550 ton chillers, three (3) 550 ton cooling towers, a 900 ton flat plate heat exchanger, and associated chilled and condenser water pumps. 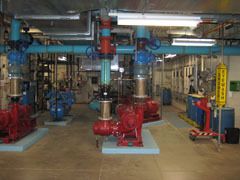 The chilled and condenser water systems both utilized primary and secondary pumping. The new chilled water plant was expanded to three (3) 750 ton chillers with variable frequency drives, three (3) 750 ton cooling towers and a 1500 ton plate and frame heat exchanger. The project also included replacement of all of the primary and secondary chilled and condenser water pumps. This increase in capacity was accomplished without increasing the overall electrical load for the plant by selecting high efficiency equipment with low water pressure drops. The project included re-piping the plate and frame heat exchanger so that it could operate in series with the chillers during transition months when the free cooling could not handle the load. 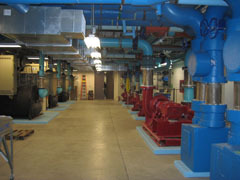 Variable Frequency Drives (VFD’s) were installed on the secondary chilled and condenser water pumps and cooling towers. The project also included a complete upgrade Building Automation System and refrigerant monitoring system. The new chiller and cooling towers were selected for a condenser water flow of 2 GPM/ton to maximize efficiency and to avoid increasing the size of the existing condenser water pumps. (970) 215-0040 Schendt Engineering Corp.